The design of a portable wheelchair ramp is just as important as the sturdiness of the materials used. Wheelchair ramps have to be as safe as possible. They also should be designed perfectly so they are easy to use and fit the space right. Richmond Ramps doesn't just have wheelchair ramps for sale. We provide an expert consultation and design at your location whether it's a home, business, or VA hospital. This is the type of personal service we give to all our customers. Give us a call today and let us know what you need. We'll make an appointment for your wheelchair ramp consultation. Richmond Ramps does everything possible to ensure you get the perfect wheelchair ramp for your home or commercial business. This is why we start the process with a consultation. We will listen to your needs and gather specific information about the layout, space, and location where the ramp will be installed. 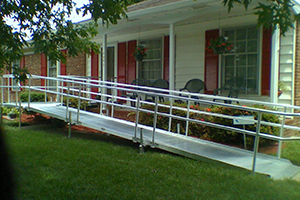 We show you the wheelchair ramp designs we have for sale and offer you customization options. We take a good look at the architecture of the home or building exterior. For indoor ramps, we gather all the same information. This helps you find the right style to go with the aesthetics. When you settle on the one for you, we figure out the wheelchair ramp size and layout. This ensures that it fits the space perfectly and is easy to use. There is a lot involved with designing a proper ADA compliant ramp system. In order to determine the type of ramp you need, we look at how your property is laid out, take measurements of your doors, determine the elevation of the property, and figure the slope at the point where we determine the ramp will end. And that is just to figure out the proper ramp length! When you are ready to get started with your ramp, we will come to your location and evaluate your property for the shape, and length of your ramp. We review the inside of your home to identify spots that need threshold ramps. We will meet with you and determine if you prefer a no maintenance aluminum ramp system, or an easy to decorate wooden ramp system. We will show you different railing options, and various add-ons for the ramps, such as steps off to the side. Once we have determined what you want, we will provide an estimate of the ramp cost and installation. If you approve, we will produce an engineering drawing of the design, and send it to production. Your ramp will be ready and installed in a few days. Once all the information is gathered, we begin the design of your wheelchair ramp. Our Richmond accessibility ramp experts know how to make it fit right and look beautiful. All our ramps are ADA compliant. They are well built with proper construction. All our ramps are portable so they can be moved. We design wheelchair ramps for all types of businesses and homes. Richmond Ramps designs ADA compliant ramp systems. Designs are determined by the type of ramp you need, how your property is laid out, the measurements of your doors, the elevation of the property, and the slope at the point where the ramp will end. Most of the time, collecting this information requires a visit to your property. Once we have collected the information we need, we determine the best layout and produce an engineering drawing of the system for your approval. If you approve, your ramp will be ready and installed in a few days.